The Ryukyu sea fire festival is the earliest summer festival to take place in Japan. This year will be the 16th edition and has the theme of “to the summer that is touched the earliest in Japan”. 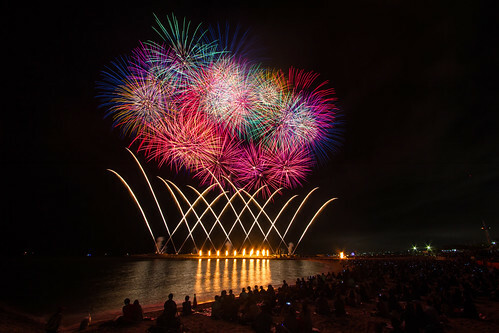 It is one of the biggest shows in Okinawa with a fusion of Japanese music and culture, also boasting to hold one of the largest scale fireworks displays in Japan. Coinciding with the sea opening, Okinawa is the only place that you will be able to find fireworks on the beach in April. There are special seating areas set up all around the beach and these can range from around ¥ 10,800 (£73.00) to ¥ 4,300 (£30.00). You can also view the fireworks from areas that don’t have any seating for free, but this will not allow you to see the entertainment on offer before the fireworks finale. The fireworks have been designed by some of Japans top pyrotechnic artists along with the worldwide designer Junko Koshino. Famed for the fireworks drawings and designs that sent Marutamaya Ogatsu fireworks Co on to win the Macau international fireworks competition in 2016. She also has participated in some of the most famous fashion shows in the world, such as London Fashion Week, Beijing, Cuba, has produced the Japan festival fashion show and the official opening of the John F Kennedy center in Washington DC. The fireworks will be lit around 19:30pm and the show will last over an hour. Prepared to be mesmerized as over 10000 fireworks, all with a rainbow of colours and an abundance of different effects light up the night sky of the southern island. With the ocean waters below, this creates a magnificent mirror image on the water’s surface. The fireworks are choreographed to a musical score of Okinawan music, a wild range of soul, classical and original chanpuru music timed within seconds so that every note comes with a bang. With the fireworks been the most popular part of this event if you are lucky enough to be in the area make sure that you arrive early especially in free viewing areas. The full event attracts tens of thousands of locals and visitors to the area all wanting to catch a part of the explosive action to end the evening.